The Tour de France race of 2017 would be the 104th edition, which is considered one of the Grand Tours of cycling. The race will start on 1st July in Dusseldorf with an individual time trial event and will complete with the final Champs-Elysees stage on the 23rd of July. This year there would be a total of 198 riders who will take part as 22 teams. The start of the tour of this year was scheduled to begin from London and if that had been the case, it would have been the third time that the Tour would have gone through the city of London. 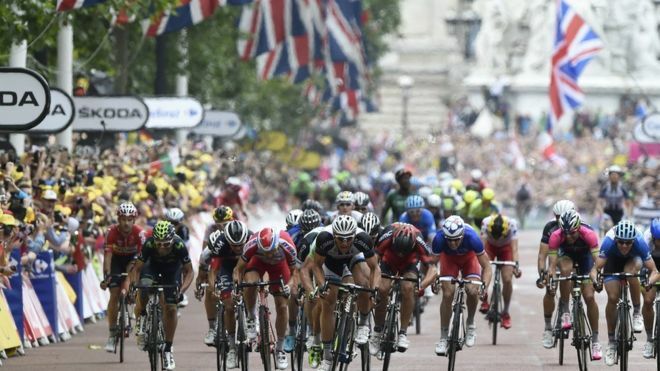 This time Transport of London pulled out of the bid and the reason cited was costing as the Grand Depart is an event that needs preparations and different kinds of infrastructure that would amount to 35,000,000 in pound sterling. If the race had started from London it would have been the third time, the previous two times being in 2007 and in 2014. Arrangements for such a grand event start early and the bid for the event was initiated in September when London has been the original choice but it was cut off when Transport of London pulled out of the bid. Finally, in December 2015 the venue of the Grand Depart was announced to be Dusseldorf. This would be the fourth time that the race will start from Germany, the first being in 1987. The city council approved the Tour as there are several cyclists from the country who have been having successful stints. These include names like John Degenkolb, Andre Greipel, Marcel Kittel and others. There has also been a resurgence of the sport in the country. The first two stages will be in the country, starting with a 13 kilometre time trial event in Dusseldorf after which there is a climb to Grafenberg. The riders then revisit the city after which they move to another city for the next stage and so forth.